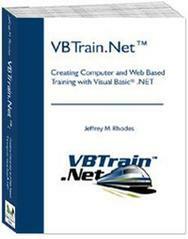 VBTrain.Net™: Creating Computer and Web Based Training with Visual Basic® .NET. The advent of Microsoft®'s .NET framework offers tremendous new opportunities for training developers. Inheritance, classes, encapsulation, properties, and methods are not terms normally associated with training, but in this book you'll learn how these concepts and many more apply to creating world-class training with unprecedented productivity. This book shows all aspects of training development with the author's preferred .NET language, Visual Basic .NET. Note that there is free shipping (US Mail) in the U.S.